Niramaya Villas and Spa is a five-star boutique sanctuary of exclusive villas set amongst 15 hectares of gardens. Catering for up to eight guests in four bedrooms - or more intimate spaces can be set within a villa for singles and couples. Hints of Bali guide the architecture where outdoors and indoors become indistinguishable. 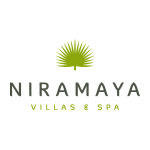 Niramaya is a place where you can reconnect with your vitality, energy and natural beauty. The spa pavilion provides a tranquil environment offering a range of indulgent and pampering beauty, massage & healing treatments.